This is a fine and sturdy mushroom of the woods and one of my favourites, both aesthetically and palatably. Although very common indeed from summer through to autumn, I haven’t seen as many as I would have liked so far. But it’s still early autumn and I do get impatient! 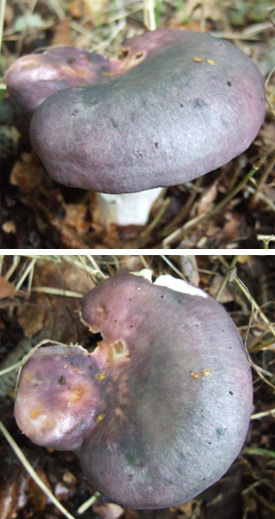 The usual haunting ground for the Charcoal Burner (Russula cyanoxantha) is in broad leaved woods, mainly with beech. It is part of the very large family of Russulas (there are 200+ in Britain alone) with the majority of well known ones having yellow, blue and green variations in colour. The Charcoal Burner gets it’s common name from the range of colours visible on it’s sturdy, fleshy cap – like the colours of a charcoal flame. Sometimes it can be one colour but often it can be variable. There’s often a mixture of blue and yellow, and in this case, with strong hues of violet and a pinch of blue/grey (you can also get browns and greens going on. This mushroom likes to show off!). The latin name cyanoxantha defines the blue and yellow colours. This Russula is from a group known as the Brittlegills, and as the name suggests, their gills are very brittle and tend to crumble and break when you touch them. But identification-wise, mushrooms always like to move the goal posts! Because in this case the white gills are not brittle, but in fact quite flexible. What can I say? It’s a rebel Russula and likes to break the rules! Although quite large, with the cap growing up to 12cm and it’s stem a up to 8cm and 3cm thick, it’s still easy to pass by. Depending on what angle you are coming from you can easily waltz by it. The cap colour is very good camouflage against the woodland floor. So keep a sharp eye out. I always tend to find these beauties growing nearby the Common Yellow Russula (or the Common Yellow Brittlegill (Russula ochroleuca)) They are of a similar size and have an ochre yellow cap, and not as tasty as our Charcoal Burner. One thing I have to say about Brittlegills, or more so – about slugs, is that the latter do really enjoy a nibble, and I mean a nibble. I think the slugs prefer the yellow and green species because it’s not often I find one in pristine condition. They are, at some stage or another, left mutilated by those hungry slime bugs! Still, it’s as much their find as it is mine! They do have a head start by living there though – and that’s just not fair! 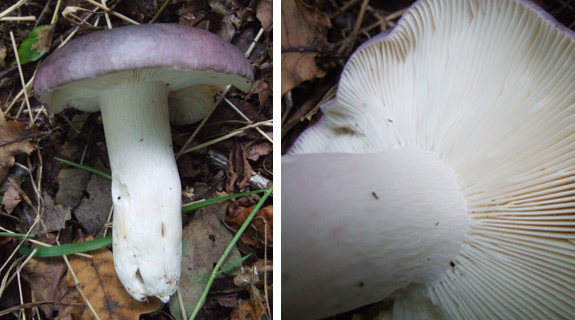 Purple/blue/yellow cap – thick white stem and white gills which are sometimes forked.